Restylane is an injection that is made up of a non animal based, clear, completely biodegadeable gel that contains hyaluronic acid. Hyaluronic acid is a naturally occurring sugar in the body. This product originated in Sweden and is now marketed by Medicis in the United States. Medicis is a top pharmaceutical company that specializes in many different types of treatments for the skin. Restylane is made up of tissues that have been cultivated in a lab and for many, this is an excellent and effective alternative to many other types of fillers including collagen and Hylaform®, which both are made up of animal products. Restylane will only need a few injections and there are no incisions or tissue removal with this procedure. There is a very low risk for complications, which pretty much means that almost everyone who wants to smooth the face and reduce wrinkles and lines can be a good candidate for a Restylane injection. 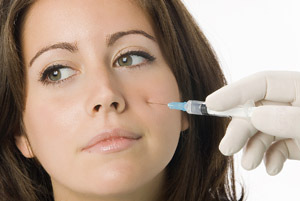 After it is injected, Restylane moves into the skin and draws and binds water. This allows for immediate visible results. There is nothing in this product to prevent natural movements of oxygen and nutrients in the treated area. With time, Restylane is reabsorbed by the body and leaves no trace of it behind. Because of this, it might be necessary to have touch up treatments to maintain your initial results. Since Restylane is the only injectable filler that is not made up of animal based products, the allergy testing that you might find with other types of fillers will not be necessary before being treated with Restylane. Many patients find that this is one of the best benefits of the treatment since allergy testing can take a couple of weeks to get done.